Orange is probably going to be one of the more popular shows this season, given the manga’s acclaim and marketing already put into it, plus the broad appeal of high school romances in general. Not only that, the manga was so readily available thanks to Crunchyroll’s manga e-reading service, so when this show got an adaptation I figured it’d be a hard one to miss. Once I heard this anime was coming, I already had tempered expectations. I thought the story was fine…as a manga. One of the reasons for that is because manga can be read very quickly. The main story here is following the relationship between Naho and Kakeru, and so the manga hit on those main points. Even though there was not much there in between, readers could breeze through it to get to the good parts. The anime does not get this privilege, and suffers for it. The world of Orange feels generic, lifeless, and all around boring. The school is just another school out in the country, and the inhabitants of said school are all nameless except for 6 core characters, and a 7th sort of brief antagonist. And then you can cut three of those main 6 in half because they really only serve as place holders to make the dynamic feel like a group. None of these 3 get their own side stories or any particular stand out moments. They are there to help Naho and Kakeru, because they’re awkward and need all the help they can get if this relationship is going to come to fruition. This is where they could’ve become their own characters. We could watch them and understand them more through their actions as they band together with the common goal of playing matchmaker. Instead, the show is completely lazy and sets up dates for Kakeru in the simple “let’s say it’s a group date, and then none of us show up” way. Aside from this brilliant and original scheme (sarcasm), they really do nothing but basic “friend stuff” throughout the entire show, stuff so mundane it’s not even worth an actual scene. Instead of fleshed out scenes with interesting or entertaining dialogue, we get montages with little bits of small talk and off tone guitar music droning on in the background. And I don’t mean off tone for the moments in particular. Fun, friendly montages accompany well with upbeat guitar music. The problem is, this isn’t really an upbeat friendly show most of the time. It’s a slow and somber telling of a misunderstood relationship, and how tragedy is handled better in a group, rather than as an individual. Looping back to the school not feeling alive, the festival episode shows this more than anything. There’s a generic band playing generic rock and generic classes doing generic things. It feels like a school festival, but it doesn’t feel like an interesting or unique festival. It especially doesn’t feel like one that has any reason to connect with the main cast. School festival arcs are for students to connect with their classes and create something. We don’t get to see any creations, nor any build up to the payoff that is the actually festival. How great would it have been if there was a story behind that dinosaur in the background as Naho and Kakeru held hands and gazed at the fireworks together? Instead it’s just a meaningless prop, from a meaningless school festival. Orange doesn’t bring its setting alive, and it doesn’t give its characters a chance to shine either. And to be honest, it’s completely unacceptable considering how much time is spent on weak montages and empty small talk. But there’s still one character I’ve failed to mention, sort of an 8th important character. We never see her, but Kakeru’s mother does have quit a big impact on the show. What she doesn’t have however, is a big impact on the viewer. The death of a mother is supposed to be enough to invoke an emotional reaction with the viewer, but for me that just doesn’t cut it. We don’t know anything about this woman, so why would her suicide affect us? I’m not saying it’s not sad, it’s just not as impactful as it should’ve been. The death of a loved one is always tragic, but we never spent any time with her to consider her a character worth caring about. We’re not even sure she was Kakeru’s “loved one”, be it that we learned she had some mental and anger issues. The loss of a mother shouldn’t immediately provoke feelings of dread and sorrow. The loss of a good mother should, and we just don’t know enough about her to make that judgement. But that’s just some of what I feel about Orange. It’s one of the few manga I’ve actually finished, and even then I wasn’t too high on it. I was hoping this adaptation could’ve fixed some of the problems I had with it, but alas it did not. Really, all that pushes this show forward are the Kakeru and Naho moments, but those are pretty few and far between. What do you think about Orange? And how do you feel about my issues with the show? Am I a little too whiny? Probably. Still, come back next week for another weekend feature and follow me on Twitter if you want to know when I post things on the internet. Thanks for reading. 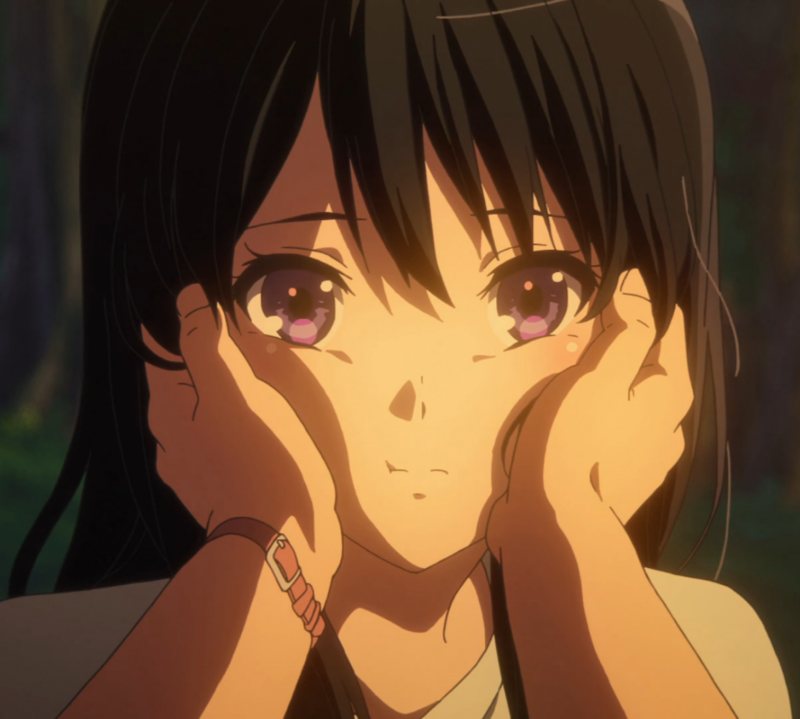 And Orange you glad I didn’t write about Hanasaku Iroha this week? I’m quite enjoying Orange. I probably won’t remember it much once the season has passed and if someone asked me to recommend an anime this season, Orange wouldn’t be the first one I’d think of, but it’s really enjoyable in the moment of watching. And the thoughts you get about changing your own life through time travel are kind of entertaining as well.